Emma Knight: I originally hail from the Mansfield, in the Victorian High Country off a small hobby farm with not a sheep in sight. There wasn't a day I did not wish I was on a larger production property, but it wasn't until my second year of my Animal Science degree at Charles Sturt University that I found myself head over heels in love with sheep and wool. The wool industry is crying out for young people to step up and take an interest and a passion in wool production. I would be thrilled to develop my career somewhere within the wool industry, possibly within production, measurement or marketing. I love being able to connect with producers, and hope to one day contribute somewhere in the vast production chain from paddock to product. The benefit of this scholarship is more than just the financial assistance, it's another way I can make contacts and networks within the industry. This semester I am studying Wool Biology and Measurement and next I will be studying Wool Marketing and Clip Preparation. I have loved the UNE Wool Units so far, and it is exciting to be able to extend my interest, knowledge and skills with a product I'm passionate about. (Emma is a 4th Yr, Bachelor of Animal Science student from Charles Sturt University). Peter Brooker: I am a first year student studying a Bachelor of Agrifood Systems at the University of New England. I spent the last 2 years working as a Jackaroo/Stud Groom at ‘Haddon Rig’, a historically significant medium wool and mixed farming operation at Warren, in central western NSW. I feel my two years at ‘Haddon Rig’ have provided me with a sound basis in the practical side of the sheep/wool industry and general farm management. The opportunity to study the UNE units ‘Wool Processing’, ‘Wool Biology and Measurement’ and ‘Sheep Production’ will now build on this experience to provide a solid grounding in science and technology. I am interested in research based breeding programs that rely on genetics, technology and management strategies. I aspire for a long term career in professional wool growing where my focus will be on developing and producing higher quality medium wool merinos with ‘top’ class wool, ideal body weights and suited to the Australian environment. I am keen to integrate and apply my knowledge and skills to make successful farm management decisions (productive, profitable and sustainable) and to be a lifelong learner in a constantly changing environment. The AWET scholarship will assist me through reducing financial issues and allowing me to focus on my studies. I am looking forward to new learning experiences when I undertake work placement opportunities with the AWET co-sponsors. My name is Gabi Ryan and I come from a family-run, mixed farming property predominately breeding Merino Sheep near Gulargambone, Central West NSW. Sheep production is something I have been exposed to from a young age and remained heavily involved with over the years. 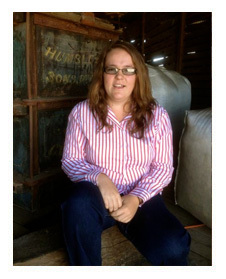 After finishing my schooling I completed a rural traineeship on a Merino Stud, Langdene Pastoral Company, Dunedoo. During this year I was intensively involved with valuable sheep, comprehensive breeding programs, genetics and sheep husbandry. Exposure to a stud breeder’s perspective on sheep production was extremely interesting highlighting the time, passion and dedication of people within the industry fueling my own passion and aspiration to work in the industry in the future. I am currently study a Bachelor of Animal and Veterinary Bioscience at the University of Sydney. This is a rewarding and challenging course, which I am gaining a lot from. The accessibility to UNE sheep and wool subjects is a chance to strengthen my knowledge of the industry and potential opportunities to work within it in the future. After completing my degree I am looking forward to participating in the sheep industry ideally to assist producers with sheep reproduction or nutrition.The Australian Wool Education Trust Scholarship is a privilege to have and is extremely helpful in assisting my studies. Studying in Sydney away from home has numerous expenses involved and this scholarship has allowed me to focus on my studies by removing some financial stress. Similarly the scholarship will assist with textbook and work placement expenses. Overall I am extremely grateful for this scholarship as it will benefit my studies immensely and expose me to exciting opportunities within the sheep and wool industry. 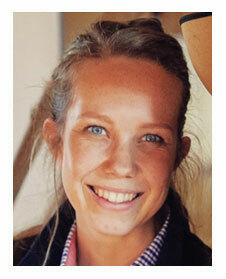 Heather Earney is a 1st year student studying a Bachelor of Rural Science at the University of New England. Coming from a mixed operation family farm near Bedgerabong, New South Wales, Heather has had the opportunity to experience the industries of beef cattle, Merino sheep, prime lambs and cropping. Through this experience she has seen the forward thinking nature of the sheep and wool industry and this has driven her to pursue a career in the industry. While the family farm has presented many opportunities for her to experience the agriculture industry, she felt the need to diversify and broaden her horizons, leading her to attend Sydney Royal Show for junior judging, complete work placements and attend field days and talks. Heather hopes to study Wool Biology and Measurement and Sheep Production later in her degree. Heather says "I want a career where I can give back to the industry and community that has supported me for the majority of my life." She feels that this scholarship will allow her to develop the skills necessary to do this and to gain more industry experience. Matthew Maunder is a first year student studying a Bachelor of Rural Science at the University of New England. He has spent the last 6 years living on a small sheep farm in the Armidale region, focused on fat lamb and cross-bred wool production. Matthew can see a strong future for the Agricultural sector and has a keen interest in agriculture. Matthew says "I am aware of some of the issues facing farmers today and in the future, in the sheep industry, and I am keen to be involved in the development of solutions in this area." The AWET Scholarship will help Matthew with his university studies through reducing financial issues and allowing him to focus on study. Later in his degree Matthew is interested in studying the "Sheep Production" and "Wool Biology and Measurement" units. He is also looking forward to work placements and the opportunity to work in varied and innovative areas. Eventually, Matthew would like to be involved in research and management of sheep. Nicola Turner is a third year student studying a Bachelor of Animal Science, majoring in Livestock Production at the University of New England, Armidale. Nicola is from a station 130 km from Broken Hill, spread over 180 000 acres running sheep, cattle and goats. Her keen interest in livestock, particularly sheep and wool production has come from her rural upbringing and family back ground. Nicola said "I have always had a keen interest in sheep and wool production. Having this scholarship has made studying and living away from home much easier for me through reducing the financial burden of being an independent, self funded student. I can now fully focus on my studies." Nicola studied Wool Processing in 2012 and plans to study Sheep Production and possibly Wool Marketing and Clip Preparation while at UNE. "WOOL482 blew me away with the opportunities we were given on the Intensive School. The lectures before the school helped to give a basic understanding but the Intensive School put it all into perspective and was incredibly interesting." Throughout university, Nicola has tried to pick a broad range of subjects including Nutrition, Feedlot Management, Farm and Resource Management and Wool Processing. "I felt that if I pick a broad range of subjects, I can get a taste of many different sectors in the agricultural industry. I feel this will also make me more employable as I will hopefully have the basic concepts for a variety of areas from feed lotting to wool processing." Career wise, Nicola has a long and very broad list of 'ideal jobs' as she is interested in all aspects of the livestock industry; "All I want to do is work with animals and try to improve production systems, profitability margins and always maintain the welfare of the animal. Ultimately, one day I want to own and run a grazing property and transfer and implement all that I will learn onto this business, making it efficient and profitable." Pete McEvoy is a third year student studying a four year Bachelor of Agricultural Science degree at the University of Tasmania. 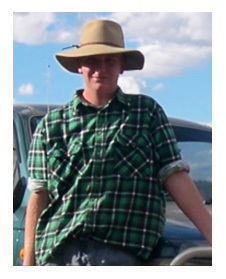 Pete is from a 350 acre mixed beef and crossbred lamb farm in North East Victoria and moved to Tasmania to study in 2010. 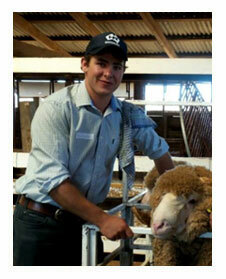 Pete applied for the Australian Wool Education Trust scholarship, because he has interests in sheep and wool science. By studying these areas, he hopes to enhance his understanding of the industry and the science behind sheep farming practices. Pete said "the scholarship has reduced the pressure on my parents having to support me away from home and increased my independence. It has also allowed me to afford the cost of textbooks and tuition fees for my studies. I chose to study wool units by distance through the University of New England, as it was a fantastic opportunity that wasn't available through UTAS". Pete has studied Wool Biology and Measurement in semester 1 and will be studying Wool Marketing and Clip Preparation in semester two. "Studying wool biology has been very intriguing and has stimulated greater interest in the area" he said. Pete also enjoyed the opportunity to undertake tours in both AWTA's facilities in Melbourne and through the CSIRO in Geelong. However, he also said "it was disappointing to fully grasp the extent of the contraction in wool related research throughout Australia in recent years". He is still unsure of which career path he is most interested in following, but undertaking these wool units has given him further scope for opportunity, especially when considering his honours project at UTAS for 2013. Pete said "so many areas of agriculture really captivate me and undertaking an overload in subjects at university is allowing me to explore as many options as possible, with wool and sheep science at the top of the list". 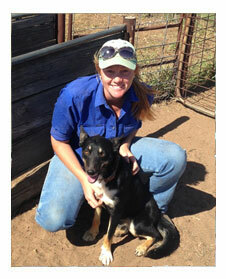 Kirsty McCormack is a 1st year student studying a Bachelor of Rural Science at the University of New England. Kirsty is from a small property just outside Inverell NSW. She has been involved with sheep, cattle, goats and horses all her life and has a great passion for agriculture and is enthused to learn and get more involved in the sheep industry in the near future. "Having such a wide interest in agriculture I applied for the wool scholarship in the hope that I can learn more and maybe work towards specialising in sheep genetics and breeding". Kirsty is planning to study the wool processing and wool marketing and clip preparation units, as well as obtaining her wool classing certificate. She looks forward to immersing herself into the industry and absorbing as much knowledge she can from work experience and industry professionals. Kirsty says, "I am not 100% certain of where I want to end up, I am just enjoying learning all I can at the moment, hoping that within my course units and work experience I may come out with an end goal. I would love a job where I get my hands dirty daily." Although still uncertain of her final direction Kirsty is passionate and enthusiastic about agriculture and keen to explore the prospect of a career in animal genetics, "with this scholarship providing me with the perfect opportunity to do so". Will Chaffey commenced studying a Bachelor Agriculture/Business at the University of New England in 2011. Prior to this he spent 2010 as a Jackaroo at Egalabra Merino Stud at Warren central west NSW. This experience combined with a family background of Mixed Farming in northwest NSW near Tamworth, has provided Will with a "keen interest" in the sheep and wool industry. Will said that he is, "looking forward to developing knowledge in this area. There is a wide variety of areas/aspects to the sheep and wool industry and being able to study and link this learning with a supportive industry through the Scholarship will give me a great opportunity to learn more, gain work experience in new areas and make new contacts." Will intends to develop a working life strongly associated with sheep and the wool industry. The $6,000 offered through the Australian Wool Education Trust/Industry Undergraduate Scholarship "will take pressure off sourcing financial support whilst studying, and provide opportunities to gain experience to relate back to my studies." "Studying the Wool Marketing, Clip Preparation, Processing and Production Units will provide the opportunity to gain a deeper understanding of wool characteristics, current research, industry opportunities and potentials at UNE which is linked to the Sheep CRC" said Will.